So you’ve decided you want to become a designer. Great! 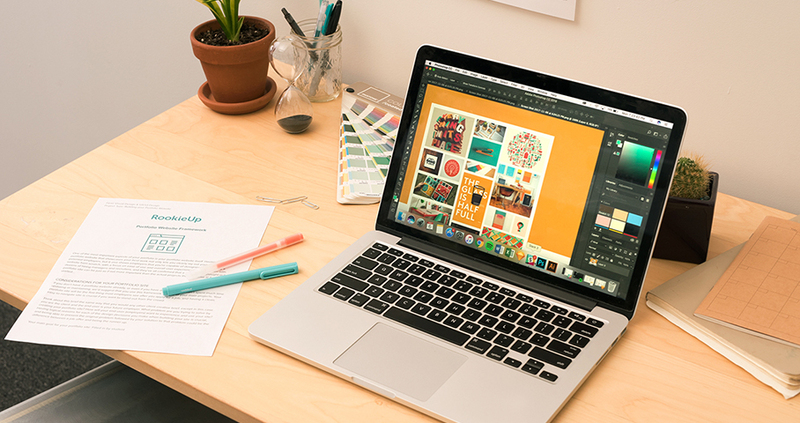 Whether you’re an aspiring Visual Designer, UX Designer, or Product Designer, it’s important to remember that your portfolio is your best chance to showcase your skills, process, and problem solving abilities to employers and clients. Most employers will only look at an applicant’s portfolio for 10-20 seconds before deciding whether to give someone an interview or not, so it’s crucial to ensure that your portfolio showcases your work beautifully, clearly articulates who you are and what value you bring, and is easy to navigate. When you’re working on your portfolio, think about your portfolio site the same way you’d think about a normal web design project. The visitors to the site (whether it’s a potential client or employer) is the “client” for this project and you want to design a site that helps them accomplish all of their user goals as effortlessly as possible. In this article, we’re going to explain a few of the common mistakes new designers make on their portfolio sites and tell you how to avoid making those same mistakes. Ready? Let’s go! First things first -- as you build your portfolio site, it can be tempting to put every single one of your projects up. After all, you spent a ton of time building them so why not showcase them proudly? This is a common mistake many new designers make, and many design hiring managers have told us they’d much rather see a clear and focused portfolio that focuses on the role a person is applying for rather than a scattershot of many types of design work. Spend some time thinking about what sort of role/company/industry you’ll actually be applying to and curate your portfolio for those sorts of roles. After all, recruiters will be much more likely to hire you if your portfolio is laser-focused on the role or industry you’re applying to. And if you need help coming up with project ideas, there are tons of great resources online to help you build amazing design portfolio projects. Different recruiters and employers have slightly different opinions on specialization versus generalization, but one opinion is generally consistent: unless you’re truly hoping to be a generalist, you should try to focus on building up deep expertise in one or two areas of design and showcasing those projects most prominently in your portfolio for relevant jobs, while also showing a few projects that demonstrate your breadth of abilities. If a recruiter lands on your website and sees projects that match the role you applied for, you’ll be much more likely to land an interview than someone who shows one example of ten different types of design work on their homepage. After spending so many hours designing beautiful high fidelity versions of your initial ideas, it can be tempting to only showcase the polished designs. This is a current trend amongst junior designers, particularly if you visit a social sharing design site like Dribbble. Many young designers assume that recruiters just want to see their final versions, however, recruiters want to see more than your final designs. They want to see how you think and they want to understand why you made certain decisions. Most companies want to hire problem solvers first and artists second -- if a design doesn’t help a user accomplish their end goal, it can be incredibly beautiful but still fail in its purpose. Think about the problem the client is trying to solve with this design. Think about the user’s goals when using the client’s product. Show your initial concepts, your goals, the client’s goals, and then go through the different phases of the project, showing why you made decisions you did and when you validated your decisions throughout the process. Many young designers might be tempted to create a flashy site design, with complex animations, hover states, and page load-ins. While it’s great to show off your creativity and design/coding chops, be sure to always ensure that simplicity is at the core of your portfolio site. We’ve seen portfolio sites that even forgot about having persistent navigation bars! They want to get a high-level idea of who you are, what type of work you specialize in, and why they should hire you. You should have a clear above-the-fold description of yourself on your homepage that clearly explains these main talking points and then presents a clear path to actually view your work. They want to very easily be able to see all of your projects and also be able to navigate between work of different kinds. So if you have Branding and Web Design work, for instance, make it very easy to switch between each type of project. They want to be able to get in touch with you easily. Have a simple contact page that includes either a direct link to email you or a simple contact form they can easily fill out. A lot of junior designers, however, forget that a template is just that -- a template. If you go the route of using a pre-built template from a website platform, be sure to add in your own dose of personality and unique flair. And never keep in any of the default stock photos, since this is a surefire way to get thrown into the Reject pile immediately. Showcase side projects! Employers love to see potential employees whose passion for design and problem solving extends well beyond their 9-to-5 job. If you’ve worked on any side projects or businesses, showcase them as their own case study on your portfolio site to show employers you love solving problems with design even when you’re not getting paid. Include a design blog. Having a blog or Medium page where you write about design trends from your own point of view is another great way to showcase your passion for design and let employers know that you really care. Don’t create a blog just for the sake of it - only do so if you feel like you have specific things or ideas you want to communicate to the design world! Add visual personality! If possible, we’d suggest adding a bit of visual flair to your site to make it more memorable. As long as your work is easy to find and your site is easily navigable, showing your personality via visual flair is totally fine! This could include adding interesting hover state animations or designing your own unique personal branding that is applied consistently across the entire site. If you’re able to carefully avoid making the mistakes that many other junior designers make on their portfolios, you’ll be well-positioned to stand out when you start applying to design jobs. Just remember -- focus your work based on the jobs you’re applying to, make your site visually beautiful while also being easy to navigate, and let your personality shine through. If you need some extra help building your portfolio or want to work with a mentor to get ready for the job market, consider enrolling in a short-term portfolio-building bootcamp or join find local mentorship communities locally, such as ones organized by organizations like AIGA. Alec McGuffey is the co-founder of RookieUp, a design education platform that offers short-term bootcamps and portfolio-building tools to give aspiring designers everything they need to build an amazing design portfolio and launch their design career.